I am most sorry for the young ones, the newbies. They who didn’t sit for 15 minutes knowing unequivocally what it felt like to have witnessed a Triple Crown winner, all unbridled joy and relief and passion, in tears and laughing for that skinny bay colt named Real Quiet. And then, as quickly as it happened, it was stripped away. A hollow, deflated feeling replaced that joy – but the memory of it was still there. We’d finally gotten it – then it slipped away. I wouldn’t wish that feeling on my worst enemy. The newbies now only know the heartbreak – War Emblem, Funny Cide, Smarty (oh Smarty! ), Big Brown – and now I’ll Have Another. The tyranny of “What If?” will follow him for all time, for unlike the others, he didn’t even get to try his luck at Belmont Park. The newbies now know what that dread hollowness feels like. They now have a piece of the cynicism that infects us long-timers, the first of what will be a deeply-rooted infestation should they show up again in the years to come. Oh, how wonderful would it have been had these youngsters seen a Triple Crown winner so early in their fandom! It’s what we all wish for, right? And yet – with each Triple Crown season I am renewed as a racing fan. I carry all the emotional battle scars of watching these horses, and have learned who to put my faith in when the big race rolls around. Despite all the naysayers, I am certain that the 12th Triple Crown winner is close at hand. I’ve stayed up late to see the Super Moon. I’ve looked through a pinhole camera to watch the solar eclipse. And I will never forget where I was during the Transit of Venus. The stars will align for that most rare of equine accomplishments. I want those new fans to feel the excitement of a Triple Crown, and like an addict looking for the next high, I want to feel it again, too. 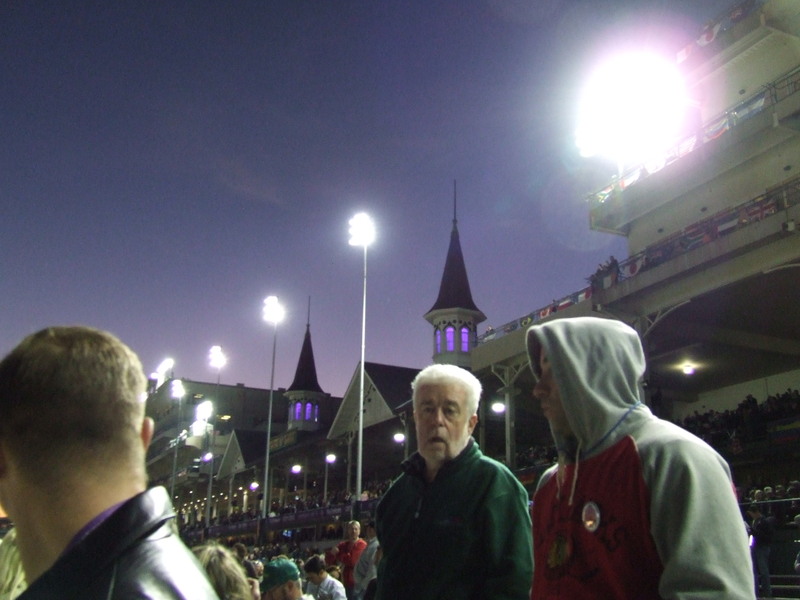 The 2012 Kentucky Derby is less than a week away, and in the next few days the drama will reach a fever pitch that won’t subside until the roses are draped over the withers of the lucky (talented and deserving?) winner. The Derby is so unlike the rest of the racing season, as discussed in this week’s Forbes, but what makes it an anomaly is the source of its magic. 99% of the students at the UA became racing fans by watching the Derby, their ultimate goal is to have a Derby horse, or somehow be involved with that race. It’s the 137 years of history and tradition, the long list of champions, both equine and human, to have their names etched on the plinth of Derby lore, that make it so alluring. It’s also about the heartbreak, as when the Grey Ghost, Native Dancer, went down to defeat in the Derby at the hooves of unknown Dark Star, or when 50-1 longshot Mine That Bird stunned everyone, including racecaller Tom Durkin, to win by 6 in the slop. There is never a dull Derby. If anything, the Derby is like the Hunger Games of horse racing. Each year, the Horse Capital, Louisville, KY, sends for tributes from each district: Dist. 1, New York; Dist. 2, FLorida; Dist. 3, The South; Dist 4, The Midwest; Dist. 5, the Borderlands; Dist. 6, California. There are horses who have been pointed to the Derby from birth, like those Hunger Games participants who train and volunteer to play in the Games. Union Rags, El Padrino, Creative Cause and Hansen have all been on this fast-track to Derby, and spent the last year preparing for this day. Then there are those who find themselves on the Derby trail by sheer luck – Trinniberg, Done Talking and Prospective all are good race horses, but do they truly belong with this group? The Gamemakers have already begun their work, throwing up obstacles to take out the tributes: Creative Cause arrived in the Capital with a thrown shoe and a cracked hoof; I’ll Have Another had electroshock therapy and hit the vet’s list; Alpha suffered cuts on his legs in the Wood Memorial that turned into an infection, and he missed the first plane to Kentucky; Went The Day Well didn’t have a workout after the Spiral until last week; Hansen got a bit of a blue tail that almost took him out of the Blue Grass. And they’re not done yet: the coming week we’ll see more drama, possible defections, and there’s nothing more unpredictable than the weather in May in Kentucky. The race itself is a test that requires every bit of physical prowess and intelligence, from both horse and rider, to complete. There are 20 tributes gunning for each other – will the pacesetters crumble, allowing a dark horse to close to victory? Or will there be more jostling and bumping than a demolition Derby? No matter what happens, we will watch, and root for, our favorites. Even if they never race again, we will be forever fans of these Derby horses. Which horse will survive the Horse Racing Hunger Games? I have my picks, but as it goes every year, it’s more about luck than anything else. And may the odds be ever in your favor. 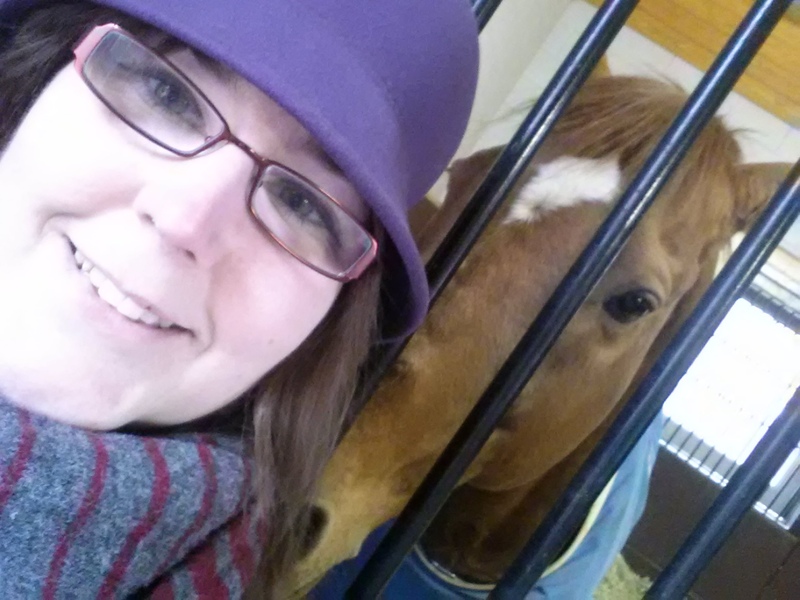 Inspired by this post on HRN, I decided to talk about when I met my favorite horse. But first, let’s get in the old TARDIS & dial it back to May 1995. It’s a lazy day in Memphis, Tenn. and in the neighborhood of Raleigh there is an almost-13-year-old girl trying hard not to clean her room. She turns on the TV that sits atop the tall chest of drawers by the closet and starts channel surfing. The channel chosen depends entirely on the quality of the reception, because this is the analog era and she lives in a non-cablevision home. By a great stroke of luck, her search ends when horses appear onscreen – it’s the Kentucky Derby! And even better – the station comes in pretty good! The colors are a little weird, but hey, the horses aren’t too fuzzy. The talking heads are buzzing about a filly named Serena’s Song. Awesome! Girl Power! She’s pretty! But then, they show a list of all the Derby horses, and a name leaps off the screen (literally, had 3-D glasses been involved, since the picture was so bad!) and into the heart of our heroine: Thunder Gulch. THIS is her Derby horse. How awesome is a horse that carries that name- it conjures up the imagery of outlaws and Indians, black hats and white hats, mustangs, Monument Valley, and showdowns at high noon. Eager to catch a glimpse of her Derby horse, she watches as each big favorite is shown, and she learns that Serena’s Song has the same trainer as this Thunder Gulch. But when will they show him? Finally, there he is! And what’s this? His jockey is wearing PURPLE and PINK SILKS*!!! It was meant to be! You know how this story ends: after stalking the pace set by frontrunner Serena’s Song, Thunder Gulch burst to the lead in the final turn and drew off to win the Kentucky Derby by 3 lengths. As he galloped under the finish line, an almost-13-year-old girl in Memphis, Tenn. became a racing fan FOR LIFE. And from that moment, I wanted to go see my favorite horse in the flesh. It would be nearly a decade before I got the chance, but finally, on a frigid day in January 2003, I met Thunder Gulch. I had learned of the January stallion shows in the Blood-Horse, and of course, Ashford Stud was one of the first farms I found when the internet came around. 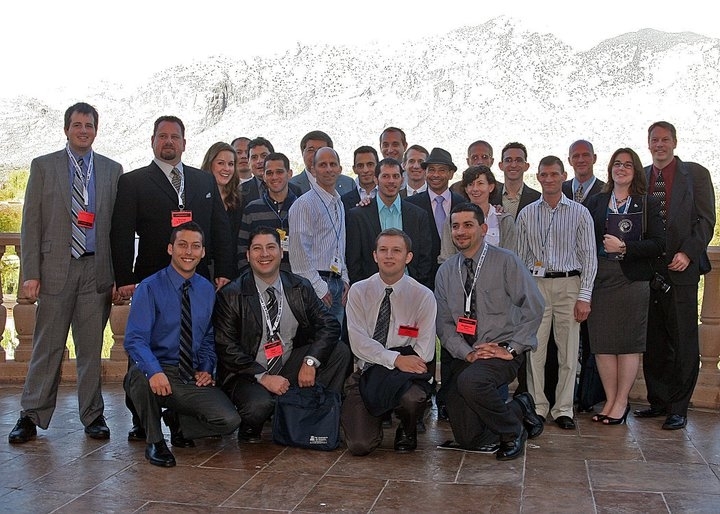 I got on the Ashford email list and that year, I received an official invite to their open house. It was during the winter break at school, and I finagled time off from the job I had at the time (which wasn’t much since I don’t remember what it was!). Kentucky that winter was ice cold. It snowed a bit, but the temps were so cold that the flakes didn’t stick to the ground when they fell, they got blown around like grains of sand. That never happened in Memphis. Ashford Stud is gorgeous, a definite must-see for any racing fan. At the time, Johannesburg was the newest star to stand at the Coolmore-owned farm in Versailles. Fusaichi Pegasus was also a big name in 2003, when his first crop were new yearlings. 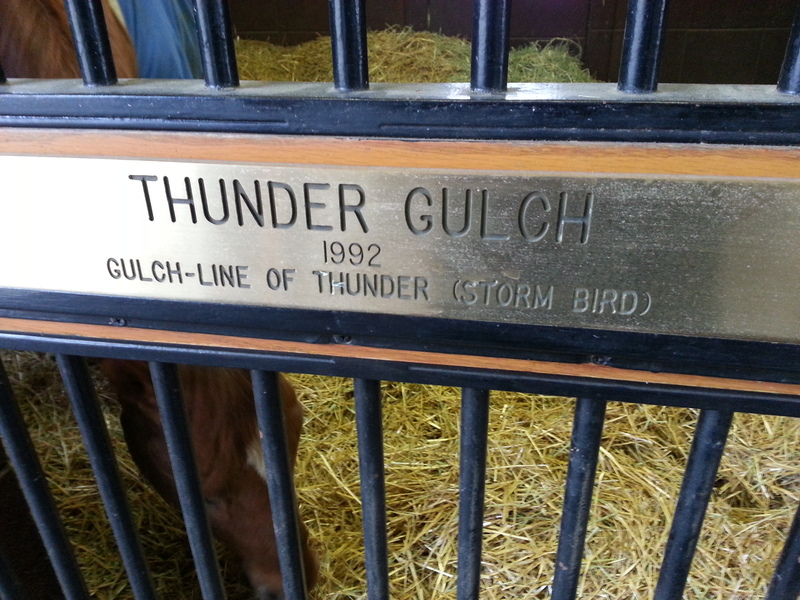 But I was there for one horse, the one who helped make Ashford, and Coolmore itself, a name in America: Thunder Gulch. When he was led out of the palatial barn, I was first struck by how small he was – I had seen his son, Point Given, tower over the world. 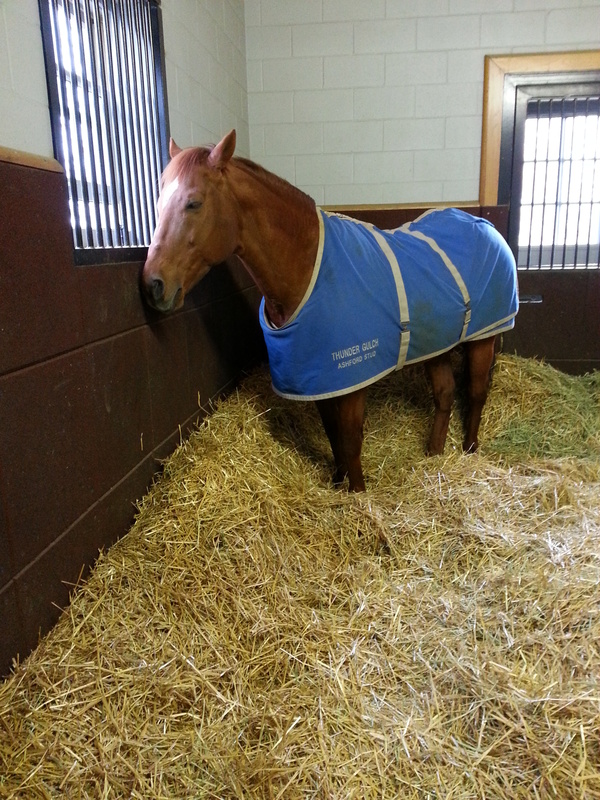 But Thunder Gulch was as compact as a quarter horse, which made him very approachable. I walked right up to him and patted his burnt-red chestnut shoulder. He drank in all of the attention, posing for several photos before the stallion manager told us it was time for him to go back inside. He, along with FuPeg and a few others, had just shipped back from Australia. They had not grown out a winter coat while on southern-hemisphere time. I could totally empathize – despite wearing a heavy overcoat with a fur hood, I was a popsicle by that time. In the years since Thunder Gulch won the Derby, I have had the chance to visit many farms, have seen hundreds of good horses, and even done the Kentucky Derby. But Thunder Gulch will always have the #1 spot in my heart, for he is the horse who started it all. *It would be almost a year before I realized that the colors were, in fact, royal blue and orange. That is when I found a copy of the Blood-Horse’s Kentucky Derby magazine with TG on the cover at the Kroger store. I told you the colors were weird on that TV! Today I sit in my tiny apartment in Shreveport, Louisiana, listening to the anguished cries of my neighbors through the paper-thin walls. You see, they are all LSU fans, and as of this moment, their golden and purple team is scoreless against Alabama in the championship game. All week long, the neighbors have worn team t-shirts, a few sport new stickers or license plates on their cars, and there’s a banner hanging from the balcony above me featuring a growling LSU tiger. Local news stations have made this football game their top story for days, and online, my friends who are Louisiana natives (and a few Memphis folks, too) are abuzz with football cheers. Even though it looks like LSU is going to lose, the excitement around the team won’t wane. In the coming weeks, horse racing will crank up its own hype machine for the biggest race in America – the Kentucky Derby. I will get out my Derby shirts, invest in a new one for this year, keep an eye out for Derby glasses at thrift shops and devour every scrap of news surrounding the first Saturday in May. It will be easy to keep track of this year, since my time is consumed with Derby news. I feel like I’m returning to the battlefield after a 2-year leave – while I was in school learning about horse racing, it was more scholarly articles, financial reports and equine anatomy than breaking news or workout reports. But even though I was out of the loop, I was never lacking in enthusiasm. The excitement never dies for the Kentucky Derby, no matter how corporate CDN gets ($50 non-refundable ticket application fee? WTF? ), or how inconsistent the 3-year-old crop is (different winners of every prep? YIKES!). I have a feeling we will see some very good horses this year, not unlike 2007 – there is already a budding rivalry between Hansen and Union Rags, which I saw play out dramatically at the Breeders’ Cup. Sabercat is an intriguing contender, whom I also saw in-person at the Delta Jackpot. Then there’s Out Of Bounds, winner of the Sham stakes, a big, long-striding chestnut who could give the Darley powerhouse its first Derby win. I am so excited! And it’s only January! 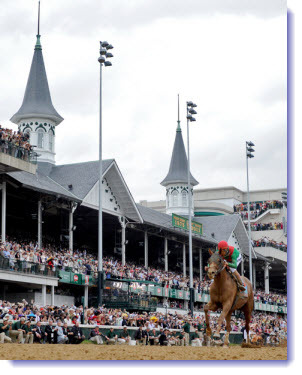 You can keep up with the Kentucky Derby 2012 contenders at Horse Racing Nation, and also take a look at the replays, interactive Derby trail and workout reports (all of which I help to collect and post!). And I will also comment here along the Derby trail, with stuff that won’t fit on HRN. As always, this is my own personal page, and I put on it what I want – I get no instructions from the Worldwide Headquarters.